The Level Mate III offers complete "all in one package" system and a wide range of options and accessories which makes it the most versatile level measurement system on the market. The Drexelbrook Level Mate III is a complete easy-to-use, intrinsically safe level system. 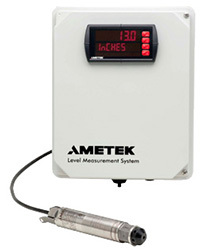 Due to a wide variety of accessories and its customized meter the Level Mate III is the most versatile level measurement system on the market. It comes with a rugged steel sensor housing for environmental protection and a series of perforations in the bottom protects the sensing port from clogging or damage. The customized meter is microprocessor controlled displays data from the level transmitter and uses a 4-20 mA analog output. It features an easy-to-read LED display offering local indication while the optional analog output can interface with ancillary display, recording or control devices. The meter can be calibrated for inches of water, feet of water, meters of water, or any desired engineering units. Setting up the Level Mater III level system is simple. Calibration is quick and easy. Options include lightning and secondary surge protectors, 4 relay expansion module and USB serial communication kit.